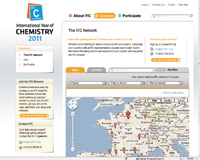 If you haven’t visited the IYC2011 website lately, you really should stop by and experience the site’s dynamic new features, which enable chemists across the globe to connect with one another and share ideas, activities and events related to the international year of chemistry. This phase of the IYC2011 website is a continuation of the technical work initiated in 2009 with the BitGroup, a Boston-based web design company. Page last modified 31 January 2010.